14K Gold good luck pendant. 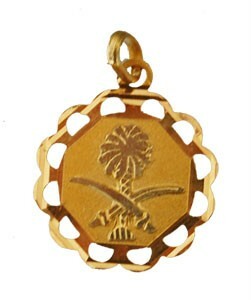 On the pendant, there is one palm tree and two swords which are crossing each other. Crossing swords mean power and patience. The palm tree means vitality, growth, and prosperity. 14K Solid Gold Initial Pendant "O"